What summer would be complete without some of that no-butter needed, sweet, farm-fresh corn or freshly ground polenta? I wait all year for this stuff, but we are still weeks away from samples of the Captain's special corn and what better way to pass the time than learn how these cool cobs go from being a tiny seed to a huge eight foot plant. It wasn't even one month ago when Matt and I first encountered these rows. At that point, they simply looked like tall grasses, but no corn in sight, not a single husk. 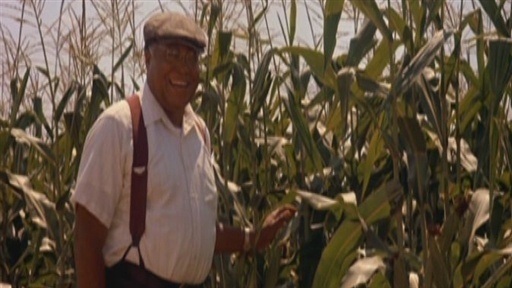 A few weeks later, me and James Earl Jones are getting lost in a sea of green. See how tall and fast corn grows during the summer months? Let's take a step back and look at how this all goes down. Corn and most other flowering plants and parents, like to be cautious and test the waters before they expose their babies to the world. Once a bed of corn is planted, a subtle green stalk will emerge from the ground and various layers of leaves begin protruding from the nodes, which are found in small intervals going up the stalk. It's a good test because if the plant can't produce these leaves, it won't be able to produce corn either. Once enough leaves grow and the corn plant feels comfortable, the male parts are invited to the party...the tassel. This crown-looking patriarch grows straight up (this is organic farming, no viagra needed), directly out of the the stalk and stands tall above the corn rows. Each of his long thin arms will shower tons of pollen grain down on top of those long dangling green leaves, but where are all the ladies at this party?? Below the tassel, the female part of the corn plant, the ear, waits patiently inside the husks found along the stalk. These begin to form at the same time as the tassel. Once the pollen lands on the leaves, it still faces the obstacle of slowly sliding down to the ear without getting blown away or shaken off. At this point everyone is at a standstill, kind of like a middle school dance until the females drag the males onto the "dance floor" using her long flowing hair-like fibers which are sticking outside of the husk (Finally, I understand why women take hours to do their hair). Just check out how many millions of tiny pollen grains managed to get from the tassel all the way down here and now are attempting to travel down towards the female parts...things are getting a little freaky. Once inside the husk, all the lucky ones end up finding partners, which if all goes well, eventually become kernels. Although it's still early in this year's season, cobs resembling corn are already forming and it's pretty incredible to see. Only a few more weeks and the corn will be ready to enjoy.